Washington Boxer Rescue View other Boxers for adoption. 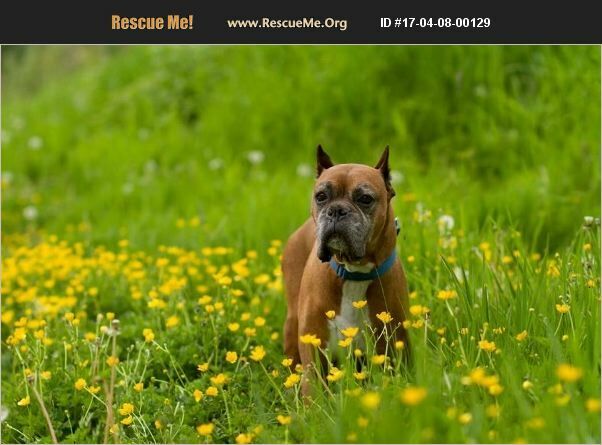 Rufus Fawn Male 9 Years old Crate trained Dog friendly Loves car rides Adult home - No stairs Great on a leash Well mannered House trained of course Fostered in Woodinville, WA I am a very handsome sweet guy with lots of love to share. I get along with all my doggy friends here--males, females and a little Chi. Laying on comfy dog beds is almost as amazing as the magic food bowl. I am the sweetest Boxer and perfect fur friend to hang around with on those lazy Sunday afternoons. I am looking for a family that is home more often than being away working all day. Taking me to work would be awesome, since I am such a friendly guy I can be a great customer service guy. A retired household might be just the ticket. So, if you want a dog that doesn't chew things up, knock you over, counter surf like all those young ones do, ... And you just want a guy to spend time with you and lay his head in your lap, showing you how much he loves you, go fill out a app so we can meet. Foster Mom thinks I am the perfect specimen of the Boxer breed. Signed Rufus with love. You can find the link to the online adoption form on the left side of our Facebook page, under the banner on our Website, or here http://tinyurl.com/WHBRAdoptApp.